Tuesday from 7 a.m. – 7 p.m.
Wednesday from 7 a.m. – 10 a.m. This year’s EXPO will be held on April 16th and 17th, 2019 at the TRAC in Pasco, Washington. 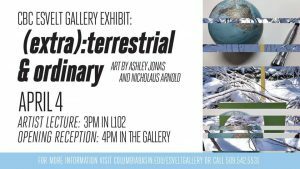 – An interactive inflatable lungs and heart exhibit, drone demonstrations, and much more! 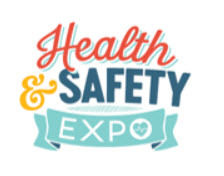 Health & Safety EXPO is supported by the Department of Energy, Hanford contractors and the Hanford unions. 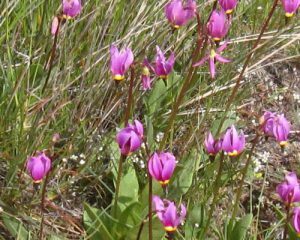 From 8 a.m. – 4 p.m.
One of our favorite walks, Saddle Mountain, displays many of the special wildflowers not often seen in the Columbia Basin: blue bells and pink-violet shooting stars in profusion! The little yellow bells of spring will be ringing on the slopes. Meet: 8:00 a.m. Van Giesen Park & Ride. This is a long day: dress appropriately for the weather, bring lunch and snacks, and don’t forget your cameras. Trip leaders Ernest Crediford & Terri Knoke. Please contact Ernest Crediford at Ernest_crediford@live.com if you plan on attending. 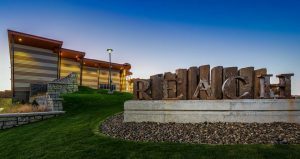 How has the legal sale of cannabis affected the Tri-Cities area? In what ways has the community benefited and what problems have been created or grown? 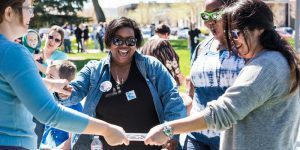 Voters of Washington were one of the first states to legalize the production and sale of cannabis for recreational and medicinal purposes for persons 21 and older. In June of 2014, the first stores opened in the state. 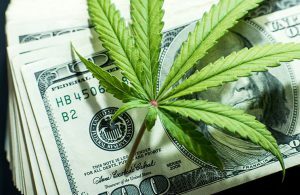 In just four and a half years the industry has mushroomed with sales totaling more than 3 billion dollars and generating more than 1.95 billion in state taxes. There are 515 retail stores in the state, and 1,425 producers (farmers)/processors, including 56 in Benton County. Green2Go, owned by Steve Lee located in Finley is the number 2 top selling retailer in the state. And there are 56 licensed producer/processors in Benton County. The results of an anonymous survey of Badger Club members and community members will be announced. Come hear CBC’s nationally recognized vocal jazz ensemble as they open the vocal weekend of Jazz Unlimited. This event is sponsored by Humanities Washington’s Speakers Bureau program. Energy Northwest, the city of Richland, the City of Kennewick and the Electric Vehicle Infrastructure Transportation Alliance (EVITA) are organizing and hosting a Drive Electric Earth Day event at Kennewick’s fast charging station located at the Southridge Sports and Events Complex, 2901 Southridge Boulevard, Kennewick. 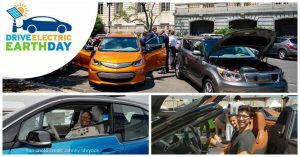 The event will include the opportunity to see plug-in electric vehicles and learn more about how they operate, what it’s like to drive them, and where to find publicly available charging stations. Representatives from Energy Northwest, Tri-Cities area utilities, the Mid-Columbia Electric Vehicle Association and other EV drivers will be on hand to provide information and answer questions. 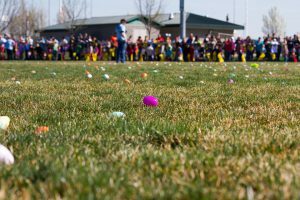 The egg hunts will take place on the soccer fields on the back of our Pasco campus. 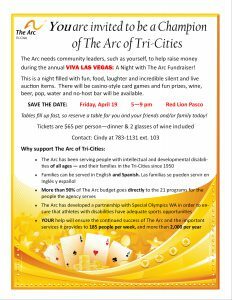 The ARC needs community leaders, such as yourself, to help raise funds during the annual Viva Las Vegas: A night with the ARC fundraiser! This is a night filled with fun, food, laughter and incredible live and silent auction items. There will be casino-styled card games and fun prizes. 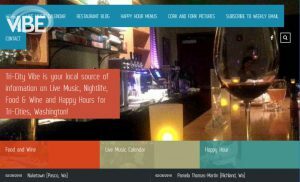 Wine, beer, pop, water and no-host bar will be available. 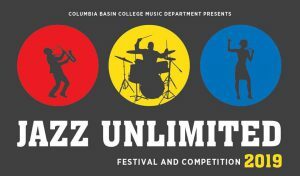 This evening concert will feature outstanding concert choirs from the day events of Jazz Unlimited at Columbia Basin College selected by the judges as having demonstrated exemplary choral technique. Taco trucks and Mexican restaurants in Downtown Pasco are participating in this annual event supporting the Boys & Girls Clubs of Benton and Franklin Counties. Customers, called “Taco Crawlers,” can purchase booklets containing vouchers good for one taco from each of the 20 participating establishments, valid from April 19 through May 4, 2019. 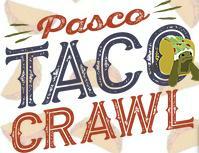 Taco Crawlers will have an opportunity to vote for this year’s “Best Taco in Pasco.” Voting will close on May 3, 2019. 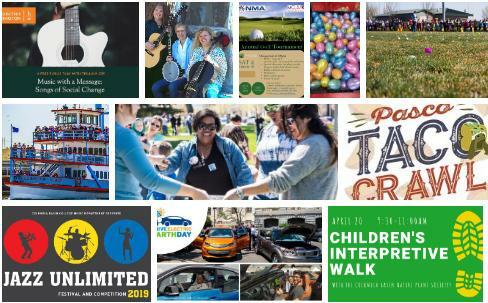 The winner will be announced at the Downtown Pasco Development Authority’s Cinco de Mayo Festival on May 4, 2019. 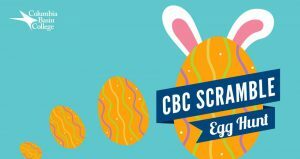 Breakfast starts at 8:30 a.m. – egg hunts start at 10 a.m. Cost: pancake breakfast is $4 and is free for kids 12 and younger. All other activities are free. 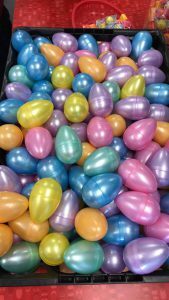 Egg hunt is for 0-12 year olds – bring basket or bag to collect eggs and prizes. From 9 a.m. – 12:30 p.m. This is a clean-up event to help the park to look nice for 2019 season, Groups are also welcome.to join us. Raking leaves, pulling weeds, cleaning parking lot and much more. Bring gloves and tools marked if you have a favorite one. At 12:30 p.m. will be a potluck everyone invited for this just need a dish to join in. It is free parking in the Park for that day. 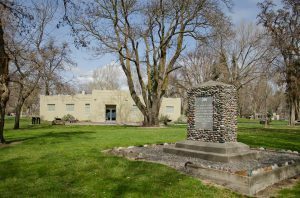 After potluck, the Friends of Sacajawea State Park Group will have their meeting for April – everyone is welcome to attend. Join us for the fifth annual Easter celebration at the Gesa Carousel of Dreams. Special needs egg hunt: 9 a.m. Egg hunt ages 0-2: 10 a.m. Egg hunt ages 3-5: 10:30 a.m. Egg hunt ages 6-8: 11 a.m.
And the fun continues after the egg hunts are done! 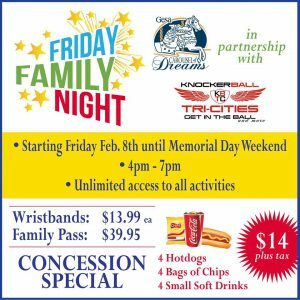 – Knockerball inflatables: 9:30 a.m.- 1 p.m.
– Photobooth: 10 a.m. – 1 p.m.
And of course, the carousel will open early at 10 a.m. for rides and smiles (rides are at regular prices). From 9:30 a.m. – 11 a.m. 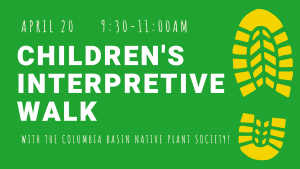 In Partnership with the Reach Museum, Richland, WA, we present a great opportunity to introduce your children to wildflowers on the Badger Flats Trail! This is a walk for every age group, parents and children alike. 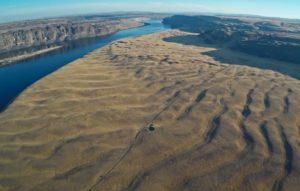 This year there will be exploratory areas set up along the way to let you “see” the shrub steppe in a way you and your children may have not experienced before. Dress appropriately for the weather, bring snacks, and don’t forget your cameras. Please contact trip leader Pauline Schafer at paulines@visitthereach.org if you plan on attending or would like more details. From 10 a.m. – 11 a.m. 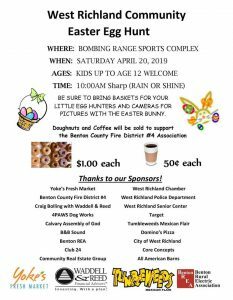 The annual Easter Egg Hunt is put on by the Benton County Fire District #4! 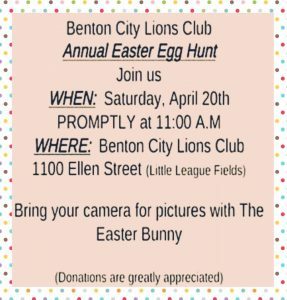 Be sure to bring baskets for the eggs and your camera for photos with the Easter Bunny. The egg hunt is for kids up to 12 years of age. The 3rd annual 2019 Celebration of Science (#CoSci19) celebrates Our Scientific Heritage. The theme for this event, “Our Scientific Heritage,” recognizes how scientific and engineering investments of the past shape our present and future. There will be booths hosted by local community organizations and businesses. 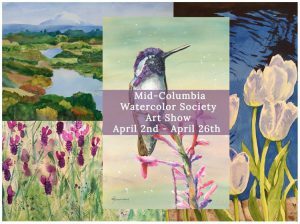 This free, family-friendly event brings the community together to enjoy hands-on science activities and engage with some of the world-class scientists who live and work in the Mid-Columbia region. And don’t forget to bring your camera for photos with the Easter Bunny! 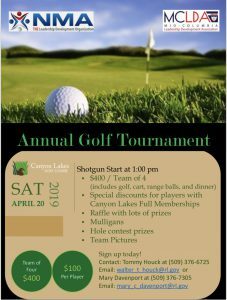 This is a fundraiser for the Mid-Columbia Leadership Development Association. 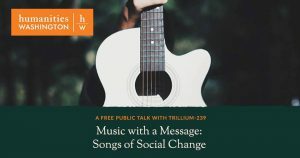 Trillium-239 is proud to offer this concert as a fundraiser for our favorite free music festival: Tumbleweed! 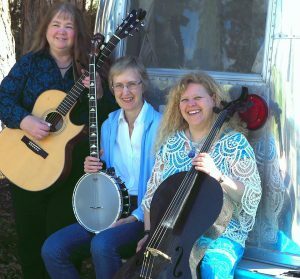 You’ll hear quirky originals, humorous songs, lovely traditional tunes and more, blended beautifully on guitar, banjo, cello, and harmonious voices. Sponsored by 3 Rivers Folklife Society and Tumbleweed Music Festival. 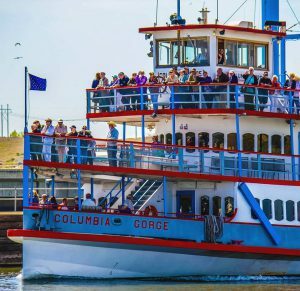 The Columbia Gorge Sternwheeler will offer 10 days of cruises departing from the Clover Island Inn in Kennewick. In addition to these public cruise offerings, the Sternwheeler will be available for one- level rentals and private events. 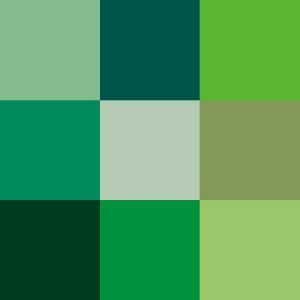 – April 19: Cell! Cell! Cell! 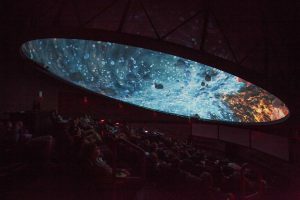 at 7 p.m. and Oasis in Space at 8 p.m.
– April 20: The Life of Trees at 2 p.m. and Stars of the Pharaohs at 3 p.m.